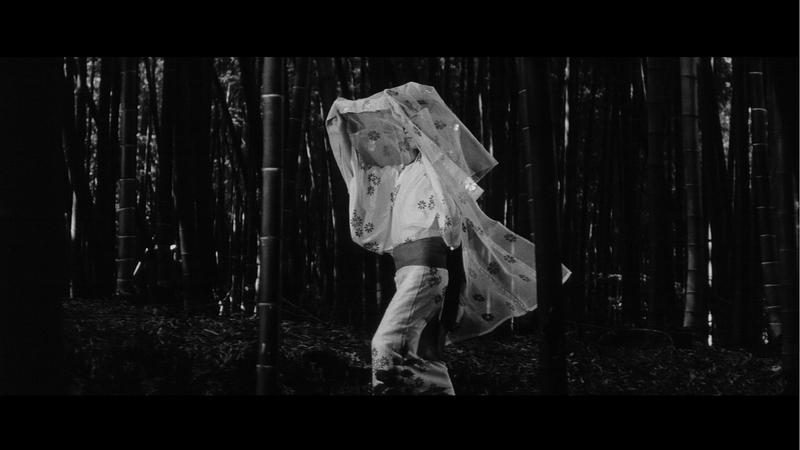 Four years after scoring an international hit with the atmospheric, taboo-bending horror classic Onibaba, prolific director Kaneto Shindô mined a similar scenario involving a literal battle to the death between the sexes in Kuroneko ("Black Cat"), albeit with a ghostly/bloodsucking twist. The tale hits the ground running with a harrowing prologue in which a mother (Otowa) and her daughter-in-law (Taichi) left alone at home by their military man of the house are brutally assaulted, robbed, and murdered by a slavering gang of roving samurai. 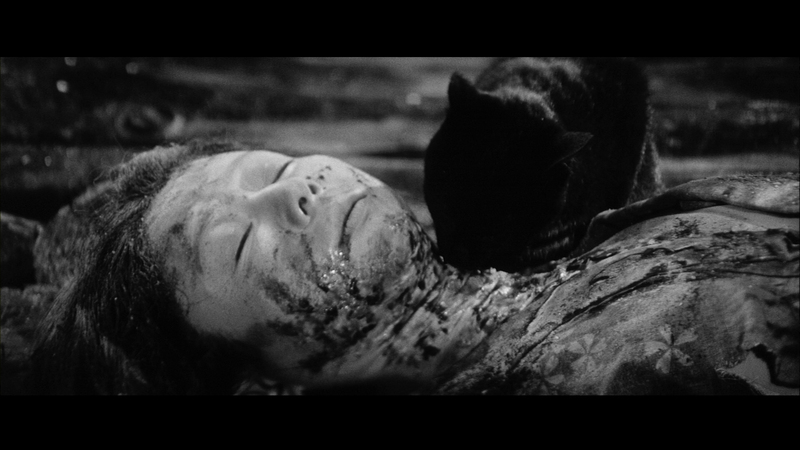 However, a prowling black cat strolls in after the attack for a supernatural communion with the bodies, and soon after, both women appear in the woods to lure samurai to their blood-drained doom. War hero Gintoki (Chushingura's Nakamura) is enlisted to get to the bottom of these disappearances and dispatch the culprits, but upon learning their true nature, he finds his own surprising personal connection to them leading to macabre complications. More of an overt horror film than Onibaba with its two supernatural women and elements of vampirism and shape-shifting, Kuroneko should have been a significant success in America but instead remained largely ignored, perhaps due to the increasingly juvenile monster movies pouring out of Japan that clouded the waters for more serious and ambitious genre fare like this. One of the few territoires to seize on its merits outside Japan was the UK, where it became a critical hit in repertory houses and remained steadily available on home video (first from Palace on VHS, then in a nice 16:9 DVD from Eureka in 2005). Fortunately the growing appetite for Japanese horror quickly increased demand for this film as well, and in 2010, Janus Films brought it back for a limited run (originally intended as a kitty-themed horror double feature with House) to introduce it to a new audience. The restrained and stylish scope compositions of the film are as elegant as one might expect from a film during this transitional period to the more full-blooded horror films of the '70s, and the wisely parceled special effects are both jolting and imaginative including some very effective gravity-defying ghost tricks and an astonishing finale that must be seen to be believed. In particular, fans of A Chinese Ghost Story might see the genesis of a few of their favorite shots right here several decades earlier. However, it's most valuable as a vicious dissection of society's attitudes to the dictated submission of women, which were hardly obsolete when this was made; it's not hard to see the attacks on gender inequality here dressed up in the guise of a stylish spook show, and this aspect continues to give the film its resonance today even considering the impact of its many successors over the years. For the official American home video debut, Criterion presents the film on both Blu-Ray and DVD in a transfer that improves on the UK disc in many respects, including much more dynamic contrast levels and, as expected, a significant increase in image detail and more natural, moderate grain. 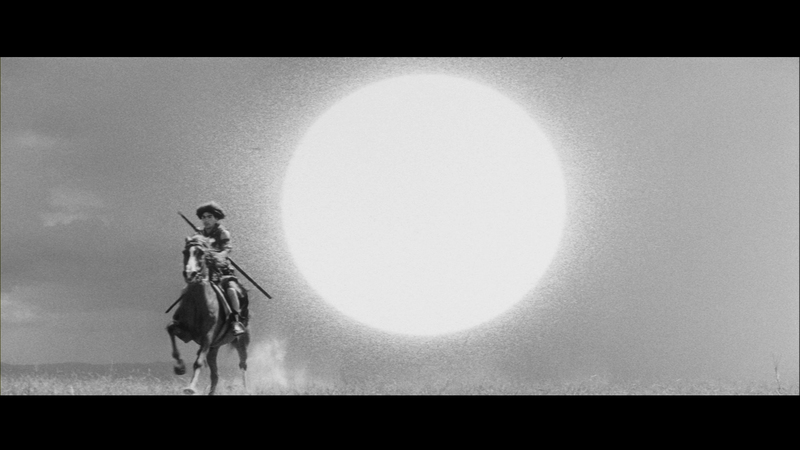 The transfer is a hair tighter by comparison but compositionally unaffected, with an overall appearance similar to their other Toho-sourced HD transfers in recent years like their Kurosawa titles. Here's hoping this and House will inaugurate a wave of their catalog Japanese titles on Blu-Ray like Kwaidan, Jigoku, and Onibaba, too. Audio is presented in Japanese mono with optional English subtitles. Shindo is represented in both a 1998 videotaped appearance at Japan's Directors Guild and a text interview from the early '70s, covering not only this film but his most significant titles from the period (many of which have still never had official English-friendly releases) and his views on how doing period films could reflect on the issues concerning him at the time. A more recent interview from 2011 with film writer Tadao Sato offers a different perspective on the film as one of the culminating achievements in Toho's significant run of supernatural/monster films and a reflection on Japan's unique treatment of its male and female citizens. The disc closes out with the wild theatrical trailer, while the booklet also includes new liner notes by the always insightful Maitland McDonagh, who offers her own unique reading on the film. An excellent example of Japanese horror from its first golden age, finally treated like the chilling and moody classic it has always been.